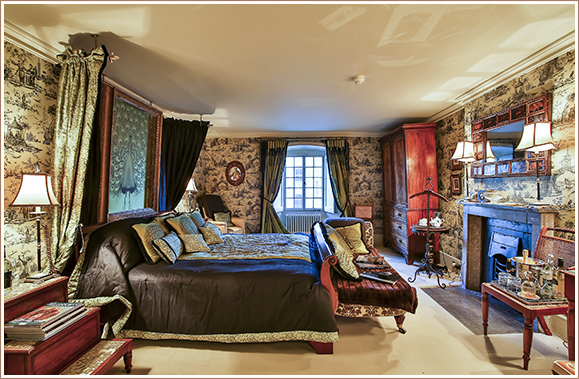 Enjoy the grandeur of a stay in the Castle’s magnificent rooms and suites. While Belvoir is first and foremost a family home, you are welcome as overnight guests in the Castle for special occasions. A total of 14 bedrooms are available for wedding guests and private parties – with a minimum occupancy of 5 bedrooms per booking. With its panoramic views over Belvoir Lakes, this double room with private shower room is one of the most spacious suites in the Castle. 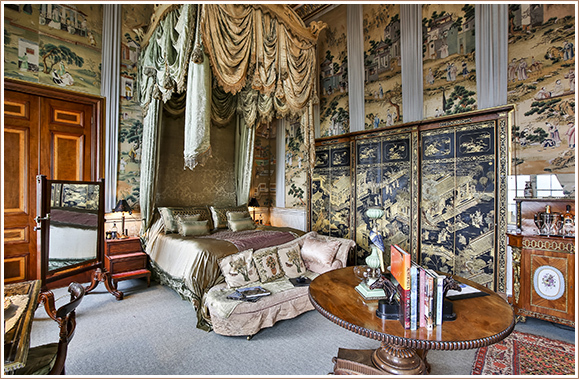 Its name comes from the magnificent early 17th Century tapestries which adorn the walls. 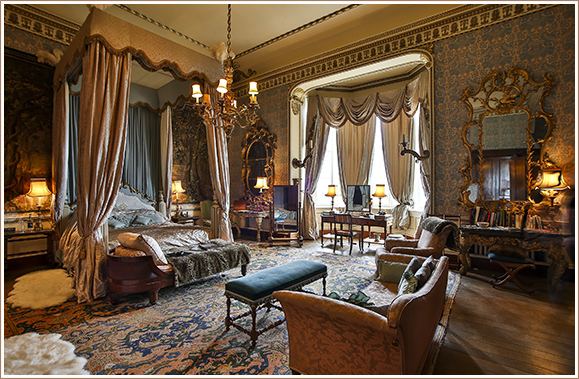 Sleep in the sumptuous bed, created especially for the filming at Belvoir of ‘Young Victoria’ – a film about Queen Victoria, starring the actress Emily Blunt. Originally part of a suite of three rooms, the name comes from the exquisite Chinese wall decorations which are a lovely feature of this room. The Chinese Rooms were originally used by family members and visiting dignitaries, and they reflect the very best of Regency taste. They also have stunning views of the local countryside – and on a clear day, you can even see Lincoln Cathedral in the distance. Perched at the top of Staunton Tower, overlooking the rooftops at the heart of the Castle, this room feels both homely and luxurious at the same time. Its peacock theme and rich colours give it a really opulent feel – and the spacious ensuite bathroom is the perfect place for you to unwind. 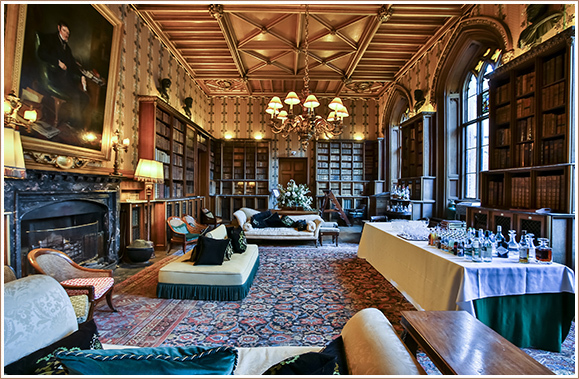 Before retiring to your room for the night, you’re welcome to enjoy drinks in the wonderful surroundings of the Duke’s Private Library and Billiards Room. A secluded location and a homely relaxing environment – perfect for private parties. Nestling in a picturesque valley about four miles from Belvoir Castle, Croxton Park is steeped in history. It was originally founded as an abbey in the early 12th Century, but was later used by the early Dukes of Rutland as a playground for their beloved country pursuits – hunting, shooting, fishing and falconry. The Lodge has now been beautifully restored and renovated by the current Duchess of Rutland – and in the winter months it’s used as a base and accommodation for shooting parties. It offers 5 star accommodation in two tastefully designed residences, each boasting four luxury double bedrooms with top class ensuite facilities. The Lodge itself is fully equipped to the very highest of standards, with a magnificent dining room, bar and lounge. The ground floor sitting room has a full sized snooker table and doors out to the garden – with stunning views over the lake from a luxurious outdoor seating area. Across the gravel courtyard is Curlew’s Nest, where the open plan living space has a more modern feel, with handcrafted wooden stairs leading to the four double ensuite bedrooms. Again, everywhere is decorated and equipped to the highest standards. To find out more about Croxton Park, click here. For more information about staying at Croxton Park, please contact our Business Development Manager at stay@belvoircastle.com. 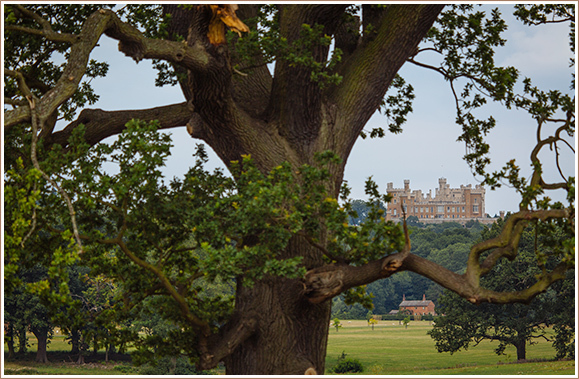 Enjoy stunning views of Belvoir Castle, and a dog-friendly gastro pub next door. Situated in the village of Woolsthorpe by Belvoir on the Grantham Canal, our campsite is ideally located for exploring the Viking Way and the beautiful surrounding countryside of the Vale of Belvoir. Next door, the Dirty Duck pub offers delicious home cooked food and a great range of ales, wines and spirits. Choose from a range of pitches, with or without electric hook-ups. Pitches cost £21.00 per night with electricity, or £17.50 per night without electricity. Clean, modern male and female toilet/shower blocks are available on site. Please pre-book your pitch and pay in advance. To book or for further information, please call 01476 871001 or email: reception@belvoircastle.com. We’re open 9.00am-5.00pm Monday to Friday. For out of hours enquiries, please call 07553 226419. Early check-in and late check-out is subject to availability – please ask at the time of booking. For something completely different, why not try our luxurious Moscar Lodge? Set on the moors in the heart of the beautiful Peak District, Moscar Lodge enjoys a stunning countryside location, but is only 15 minutes’ drive from the cosmopolitan city of Sheffield. With sumptuous interiors designed by the Duchess of Rutland, Moscar Lodge combines unique décor and antiques collected from around the world with home comforts and all the latest modern technology. Moscar Lodge sleeps up to 20 guests in king, queen or double beds in eight ensuite rooms and a further two bedrooms with private bathrooms. Our ‘entertainment basement’ boasts a snooker table, Sky TV, and a Whiskey bar. Outside, there’s a tennis court and swimming pool – and over 6,000 acres of wild unspoilt moorland for you to explore. Our housekeeper will be on hand if you need any help or assistance during your stay – and if you don’t fancy catering for yourselves and would like B&B or even a full meal package, we can arrange this for you, too. To find out more about Moscar Lodge, click here. For more information about staying at Moscar Lodge, please contact our Business Development Manager at stay@belvoircastle.com.